"In 2014, I have decided to raise money for charity. Several of my family members have been effected by cancer over the years and I have decided to compete in a sponsored event in their memory. I have teamed up with local businessman Mr Vince Ferguson, CEO of Inciner8 International to raise money for our nominated charity Cancer Research UK. 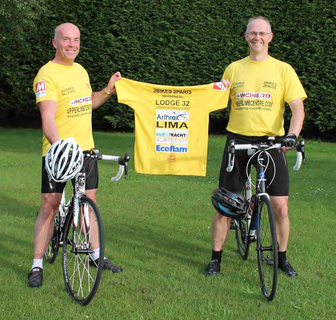 As a team, we will be riding bicycles from London to Paris during July covering 300 miles over 4 days. This represents a big challenge for me. I have not ridden a racing bike in over 25 years and I will be in my 50th year when I perform this challenge. We hope to raise lots of money for this very deserving charity. In some organised charity events some of the sponsored money is used to pay the expenses of the participants. In our case, we are paying all such expenses out of our own pockets. Thus we can guarantee that every penny that you donate will go directly to Cancer Research UK. We are also welcoming donations from corporate sponsors and will be designing and wearing T-shirts bearing the names of these sponsors. We recommend a minimum donation of £100 to secure such sponsored advertising. Priority positions and larger fonts will be reserved more generous donations."